Director and rock drummer Jonas Åkerlund, well known for his many music videos, gives us a neo-noir film, adapted from a Dark Horse graphic novel by screenwriter Jayson Rothwell. The Damocles company features a deadly sword (get it?) and is run by the evil Mr. Blut (Matt Lucas) hires top assassins to take out high-value targets around the world. The company policy is to “retire” its hitmen at age 50 and pay them a hefty pension. However, there is one snag: Blut is cash-strapped and rather than pay millions in retirement funds, he has his retirees murdered so that their pensions can revert to Damocles. Duncan Vizla (Mads Mikkelsen) is nearing retirement age in two weeks and plans to move to a lodge in a remote part of Montana. Vizla is the world’s top assassin, known in the trade, as “The Black Kaiser.” He has recurring visions of a family that he nearly wiped out except for their young daughter. After surviving a put-up assignment to Belarus where he is nearly killed, Duncan returns to his lodge and runs into his only neighbor, a lonely, fearful woman Camille (Vanessa Hudgens). As this unlikely couple bonds, Duncan teaches Camille the art of war, but he is tracked down by Blut’s kill squad: Vivian (Katheryn Winnick), Hilde (Fei Ren), Sindy (Ruby O. Fee), Karl (Robert Mallet), and Facundo (Anthony Grant). After a fierce gunfight, Camille gets kidnapped and when Duncan goes searching for her, he is drugged by Porter (Richard Dreyfuss) his former instructor and taken to Blut’s castle. After days of vicious torture, Duncan miraculously escapes, killing all of Blut’s guards in the process. Aided by former girlfriend Jasmin (Ayisha Issa), Duncan recovers from his wounds and goes after his former employer in a race against time to save Camille. Consider this film a “poor man’s” version of The Punisher, Kill Bill, Hitman, and John Wick as it revels in blood, gore, and violence for its own sake. If there were anything resembling a real storyline, it is swamped by one shoot-fest after another. Mads Mikkelsen does the best that he can with his comic book character but there is so little to build on, I could almost feel his level of discomfort in trying to portray a superhuman killer who refuses to be taken down. The relationship, such as it was, between a nearly unrecognizable Vanessa Hudgens and her much older protector never clicked for me and their apparent previous “connection” gets telegraphed so far in advance of the film’s conclusion that no spoiler-alert is needed. Perhaps the highlight performance goes to the comedic efforts of Matt Lucas as the namby-pamby crime boss, complete with Elton John haircut and wardrobe. 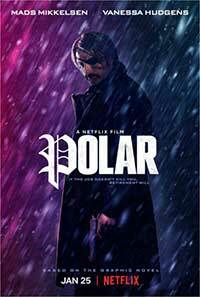 Netflix Originals has been throwing a lot of films our way but Polar is one that really does need to get tossed away. Just bypass this one and take the two hours to clean out your garage; it will be a much more rewarding use of your precious time. 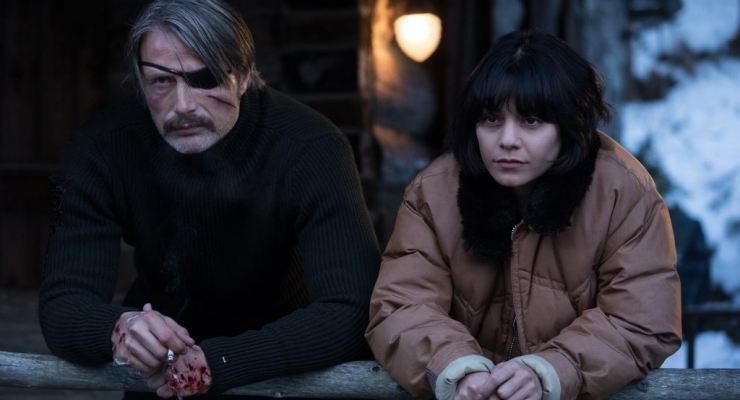 Adapted from a Dark Horse graphic novel, Polar is an endless exercise in blood, gore, and violence that does its cast no favors as a retiring assassin tries to survive a hit squad hired to prevent his getting his pension. The 'Netflix Original' film is available in 4K Ultra HD with Dolby Vision on the streaming service.